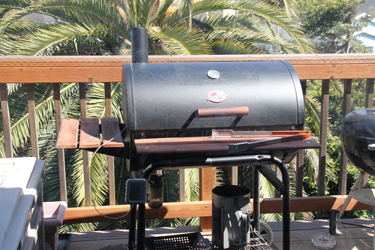 Last year, we bought a new barbecue grill and Nick smoked ribs on it for the first time. They were awesome. 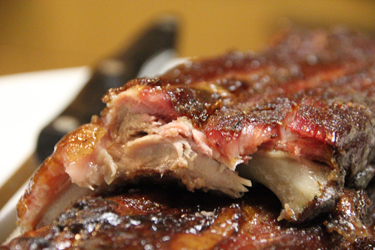 When I tasted them, I realized I’d never have to go to another barbecue restaurant again – well, unless I wanted to – or had a craving for ribs that couldn’t wait five hours. Ha! Well, since I was able to witness this magical process first hand, and since the result really was so wonderful, I decided I wanted to be able to say I’d done this myself as well. 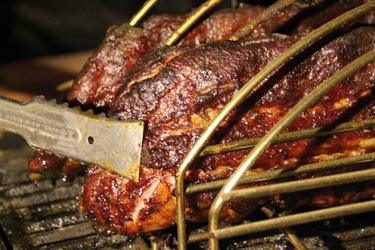 Today, I smoked ribs in our grill for the first time ever. 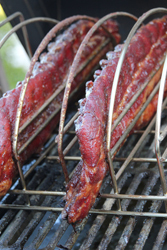 I used the same technique and recipe that Nick did last year, from AmazingRibs.com. 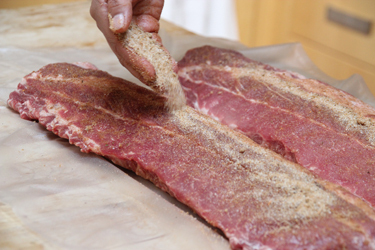 The first step was to remove the silver skin, a layer of membrane attached to the underside of the rib rack, and then apply the awesome rub that Nick perfected last year. 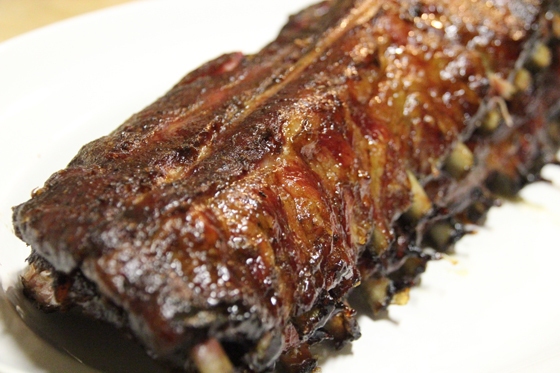 After making sure the rib racks were nicely coated with rub, I wrapped them in plastic wrap and put them in the fridge for a bit while I got the grill going (you can actually leave the rub on the ribs overnight – we always forget to do that). 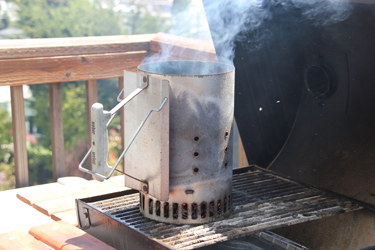 We put a pan of water in the bottom of the grill when we smoke to keep the air inside more moist. I filled an aluminum pan under the spot the ribs would go with water, and then I lit the chimney starter (so glad I got to use this for the first time this year!). 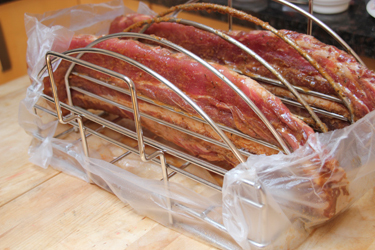 When I took the ribs out of the fridge to put on the rib rack, I realized I’d actually made a pretty cool little solution for myself – the juices from the ribs were captured in the Press’n Seal wrap I’d formed, and by putting the rack on top, the ribs in the rack, and then by just sticking the loose ends of the Press’n Seal to the rib rack, I wouldn’t drip all over the place while transferring the rib rack to the grill (normally I’d have to transfer the rack to a cookie sheet to prevent drips, and dirty up a cookie sheet just for that – but not here!). Cool. On they went. 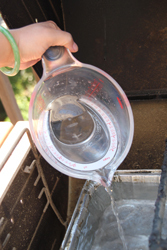 I used an oven thermometer to monitor the temperature inside the grill, and added charcoal as necessary. 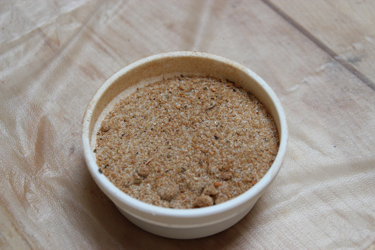 I wanted to keep the temperature at around 225F, but I also did not want to open and close the lid of the barbecue too often, which throws the temperature all out of whack. Temperature control was not easy for me on this, my first time out! 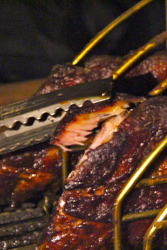 After a few hours, the ribs were looking great, but this was not the finish line. Low and SLOW is right. 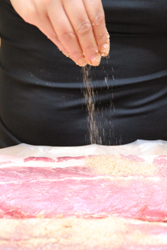 Even though they were cooked, and the sugar in the rub was getting caramelized nicely, the ribs still needed to be cooked for a while to break down the connective tissues in the meat, producing that lovely “fall off the bone” quality. 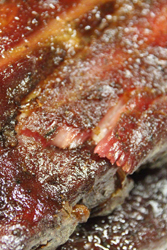 With a few hours left, I slathered on some barbecue sauce (putting this on too early can sometimes result in burnt sauce on your ribs). 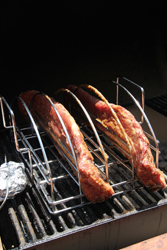 Your smoked ribs are done when they pass the “bend test” – you grab an end of the rack with your tongs, and bend. 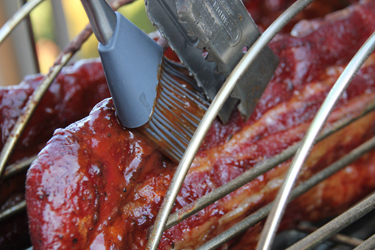 If the meat breaks apart, you’re good to go. It’s hard to see the crack at the bottom of the rack I’m bending, but the piece on the top easily broke off. YES. 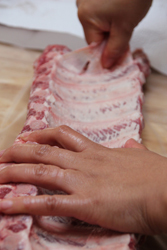 More evidence of the bend test … oh yeah, that’s fall-off-the-bone tender. 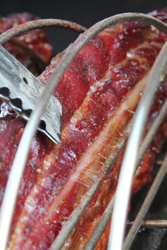 The way you can tell meat has been properly smoked is the pink “smoke ring” at the edge of the meat. 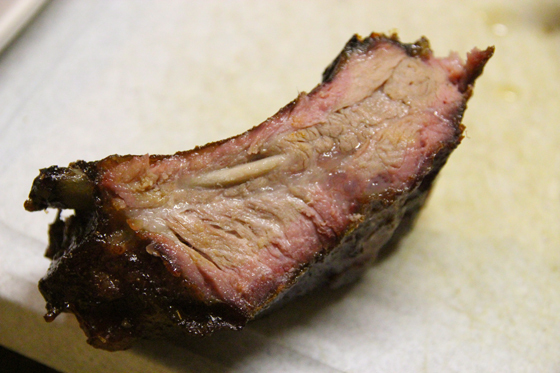 If you go to a barbecue joint and you don’t see that on your ribs, you don’t need to go to that place again. Just so you know.